If you’ve expanded a Hornby DC model railway set beyond the basic circle you may find your trains slow down in places. Most of us start with Hornby model railway sets which come with enough OO gauge track for a small oval or continuous loop. The controller connects to the circle of track and the trains merrily run around until they are stopped or reversed. Bliss. Then we expand the track, making the oval bigger wth a few sections of straight track, perhaps adding points for a siding or two or even adding secondary oval outside and linking across. The possibilities are, of course, endless. But then the trains start to slow down. The connections are rechecked and the rails cleaned – read this guide to track cleaning if you’re unsure of how to do this – but still no joy. This is an issue that I’ve touched on before but judging from my inbox is a regular problem so it’s worth covering again. The most likely problem is that power isn’t getting around all of the track. To recap, power flows from the power clip on one rail to the next through the fish plates that hold the rails together. But power can be lost at the joints and on long runs of track and this power loss can be enough to bring the locomotives to a crawl. The solution is to supply power at regular intervals around the track. 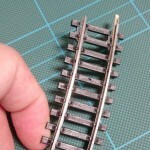 And the easiest way of doing this is to get some of these Hornby track link wires and daisy chain them around the track. Connecting these is no harder than attaching the original power clip and as mentioned all you need do is connect one end to a section of track where the trains run normally and the other to another section of the track further on and repeat this working around your layout. The railway isn’t then reliant on power going across all the track joints and you should have sufficient supply at all points for the trains to run smoothly. I cover these track link clips in more details in the original post on power clips if you want more information on them. As the railway grows and you perhaps move it to a dedicated baseboard I’d recommend more sophisticated solutions such as soldering wires from the controller/transformer to the rails in multiple places and having several controllers providing independent operation of different sections of the track but this is beyond the scope of this post. 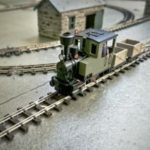 If you continue to have problems drop me a line via my contact page (or email info @ modelrailwayengineer.com) and I’ll be happy to try and help.